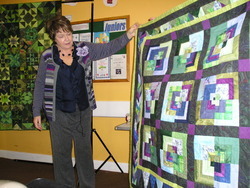 January started well with Dorrie’s 17th talk arranged at Bovey Tracey. 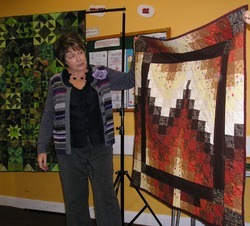 Elaine Buckley took us through her journey of quilting, telling us anecdotes and stories along the way and proved to be a wonderful quilter and raconteur re her quilting life journey. Members came from far and wide, enjoyed the talk and shopped at Serendipity and Strawberry Fayre. As ever the day cheers us all up and helps ban those dull winter days. Snow did not stop play! !